4. 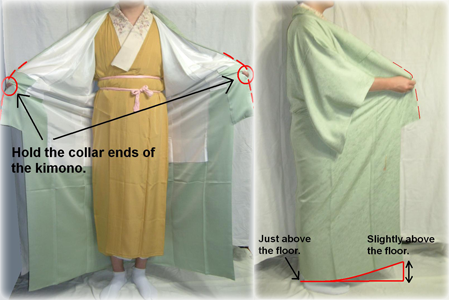 Hold the end of kimono collars. Raise them so that the back of a hem is coming up to just above the floor. The front of a hem should be pulling up to a little bit more, slightly above the floor. 5. 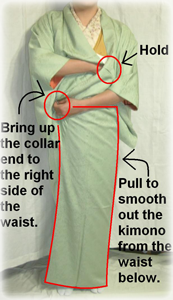 Wrap the right side of panels first, and the end of a collar should be put on the left waist. 6. While holding the right panel, wrap the left panel over it. 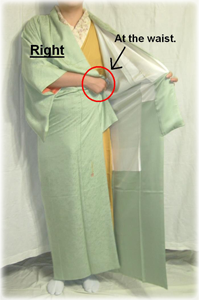 A kimono should be smoothed out (both front & back) from under the waist. Make sure that both the right and left side seams are along with the side of your body.